One of the most common questions I receive is what my flashcard deck looks like and how I think one should organise a deck of flashcards for optimum learning. The reason I seldom give straight answers to these questions is that the true answer is usually “it depends”. However, I can still say quite a lot about what it depends on and I will try to do so in this article. Note that what I say here is generally applicable for flashcard programs in general (including paper flashcards, actually), but the specific software you’re using might limit what you can do. Anki is the only program I know that allows you to do everything I talk about here and more (although it is certainly harder to use). Other programs might be really good for other reasons, such as Skritter being excellent for handwriting, but this is not something I plan to discuss in this article. Instead, I will keep to major principles and leave different software for later. One of the most immediate problems that faces people who use spaced repetition software is that they need to decide how they want their flashcards to work. In its most basic form, this question is a matter of direction. The most basic kind of flashcards have two sides, front and back, and you need to decide what goes on the front and what goes on the back. This means that if we want to learn 500 words from the textbook we’re currently using, we could end up with 500 words, but 1500 flashcards, three for each word. This might be manageable, but if your vocabulary swells to thousands of words, your flashcard deck will become unusable very quickly. This is what I mean when I say flashcard overflow and it’s a very real problem. Before we start talking about solutions, let’s look at a second problem that is the nail in the coffin for the idea that you can create flashcards for everything. 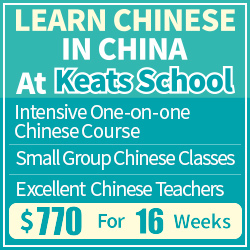 Let’s say we encounter the sentence 今天太阳很大 and we want to learn it. Should we put the entire sentence on one card? Should we add 太阳很大 to focus our attention on the fact that we can say “the sun is big” in Chinese to indicate that it’s sunny? Should we add 今天, 太阳 and 大 as three separate words? Should we also add 阳 as a separate character that means “sun”? Or perhaps break it down even further and add 阝 which isn’t a character in itself, but is a common component that means “hill”, and 日 which is a character that also means “sun”? Clearly, we can’t do all of this at the same time, especially not consider that each question can be answered in three ways depending on what you put on the front of the flashcard, the number of cards will spin out of control very fast. The question, then, in what should we add? What cards should I add? It depends on what you want to learn! Let’s return to the “it depends” answer I usually give to people who ask about flashcard models and review directions. First, the review direction (i.e. what you put on the front of the card) is mostly determined by what you use your flashcards for and what you cover through other means of studying (remember, spaced repetition software isn’t a panacea). Your default option should be a short phrase. It should be long enough to show how something is used, but apart from that, it should be as short as possible. It should not contain many other unknown elements. If we take the above sentence about the sun shining, I would add 太阳很大. You don’t need 今天 because it could arbitrarily be replaced by any other adverbial. This produces a very short phrase. If you’re eager to learn how to use this right now, go for either English on the front, Chinese on the back or a cloze sentence, 太阳 _ _, perhaps with a clue. For basic words, add both characters to pronunciation/definition and definition to pronunciation/characters. You need to understand these words and you need to be able to produce them as well. If the words are really basic and if you practise Chinese often, you can probably do away with the second type of cards because you will learn that by using the words. When you encounter new sentence patterns or grammar, use sentences. This should be quite obvious, but don’t treat sentence patterns such as 因为… 所以… like single words, instead add sentences. If you find new instances of the same pattern that don’t fit your previous understanding, you can consider adding these as well. I don’t think that adding an example sentence is enough, though, you need the sentence to be part of the question. For anything beyond the basics (synonyms of words you already know, for instance), just add characters to pronunciation/definition. 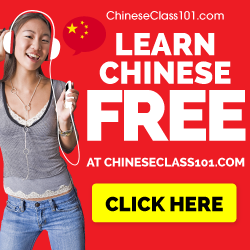 Your goal here is to boost your understanding of Chinese, you will learn how to use these words through exposure, but you need to understand Chinese in order to get exposed to it a lot. I’m a firm believer in that we need to learn things passively before we learn them actively. Exactly how to do this will be the focus of at least one future article. Whenever you encounter problems with words you have already learnt (such as something that goes against your understanding of the word or shows a new, cool ways of using it), focus on the problem and add a card that targets that problem. For collocation problems and problems with function words, use cloze test (a test where you remove the keyword from a sentence; fill in the gap); for characters you forget how to write, add single radicals and use mnemonics. Don’t go on tilt, be sensible. The reason for wanting to learning the item – When you consider adding a flashcard, you presumably have a reason for doing so (if you don’t, you really shouldn’t add the card). Why do you want to add it? The obvious answer is that you want to add it because you don’t know something, but try to think one step further. What is it that you don’t know? If you see the sentence 今天太阳很大 you probably know at least some parts of the sentence. If you found the collocation 太陽-很大 new, focus on this (gap text or translation). If you didn’t know the word for sun, then adding the word 太陽 is a bitter idea. If you weren’t familiar with the word order in the sentence, you might want to add the entire sentence. The predictability of how the item is used – Some parts of a language have very strictly defined functions, tend to be more or less the same across languages and are therefore quite predictable. For instance, “table” is very similar to 桌子 and if you always translate “whale” into 鲸鱼 you will be right most of the time. In these cases, context plays a minor role, so adding entire sentences isn’t necessary; going for a single word is fine. Of course, you should try to add as few things as possible, we’re trying to deal with flashcard overflow after all! The productivity of the item – Productivity here refers to the number of expressions a particular item can generate or be part of. So, the most common radicals are ridiculously productive, whereas some chengyu (idioms) are not, which is one of the reasons I think learning chengyu is mostly a waste of time. The more productive an item is, the more you should consider adding it as a separate flashcard. You can use the common rule of three to determine this if you’re new to Chinese, so if you see something appear three times in different characters/words/sentences, you should consider learning it as a separate item. In order for the above approach (my philosophy) to work, you need to spend a fair amount of time reading and listening, as well as actually practising using the language. In other words, this is not a method that works well if SRS takes up a large part of your study time. If it does, I would lean more towards using sentences since this is closer to the way the language is actually used. This is too complicated! Is there a shortcut? This might look very complicated when written down, but the process actually becomes natural quickly. First ask yourself what you want to be able to do with a certain word. If it seems likely that being able to know what it means is enough, go with Chinese on the front of the card and the rest on the back. If you want to add the card because you really want to be able to learn how to say this now rather than later, put the definition on the front of the card and/or use a cloze test. The most important thing to understand is that you should have an active relationship to your flashcard deck. It’s not like you have to decide exactly how to do things now and then stick to that for the rest of your life. For instance, learning the meaning of lots of characters can be very useful at a certain stage when learning Chinese, just as learning radicals can, but at some point, this stops being meaningful. Don’t hesitate to delete, change or add flashcards or flashcard models as you go a long (please read this article for a more thorough discussion of editing/deleting flashcards). 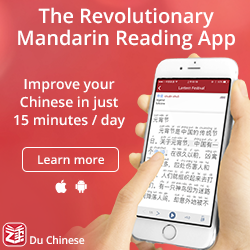 Spaced repetition software should be a tool you use to maintain certain aspects of the Chinese language, not a chain that binds you to ways of studying you neither like nor find useful. I’ve tried most if not all of these at various points. What I’ve settled on for some time now is two-way whole sentences, and nothing else. I have a Chinese sentence, and an English version of it, and have to do translations in both directions, ideally out loud. I try to get through as many of these as I can each day. I use sentences for grammar, vocabulary, collocation etc. I find the simplicity of this lets me keep it going in the long term. Do you do this even for words that are very easy to use, such as technical nouns or similar, that are essentially used the same way as they are in English? It seems like a waste finding, entering and reviewing a whole sentence if you’re actually only interested in one word! If I relied more on flashcards, I would do roughly what you do. Question: do you all have one massive deck that you keep adding to? Or several decks e.g. : vocab from books / a particular textbook? Or organize it along a period of time eg. vocab from February 2014.. vocab from March 2014? I have multiple decks to organise my flashcards by textbook. This allows me to review words in context later on. But when I study them I study all the decks together using software that prioritises new words over older ones, but still mixes in the older ones for review. I found the review component really important because you forget previous lessons words otherwise. I found Flashonary great for this. I typically use one deck for each subject I’m studying, so my Chinese cards are all in one deck, but I have a separate deck for English and Swedish and some other subjects I’m studying. I’ve found that having many decks (in Anki) is just a nuisance and a bit unnecessary, tags do the job. On deck to rule them all. With tags! I do keep separate decks for other subjects, though, such as other languages or other things I might want to learn. The overflow problem can be solved with a better developed flaschcard program. I’ve been using one from iTunes called Flashcards Deluxe. $4. You can have “five-sided” cards. It does pictures, sounds, and even a writing option to test your hand memory (its self-check, not like Skritter’s fancy program…but this is $4). The guy who created it works with Taiwanese companies, so he know’s exactly what its’ like to study Chinese. And he’s a great developer. I think you misunderstand what I’m talking about here, this isn’t a technical problem ! You can have n-sided cards in Anki and you can display them in any way you like. I haven’t tried the app you’re referring to (and can’t if it’s on iTunes), but if you by five-sided mean that you can enter five different kinds of information for each card, Anki already does that. If you mean that the information can be revealed in a five-step process (i.e. showing first the front, then side two, then side three and so on), this is more original, but not very useful because you’d give away answers to later questions earlier on. In any case, I don’t think this is technical problem at all, it’s a problem because if you review everything you can, you will end up with a million flashcards! I used Anki exclusively for a long time and think it is a great program. However, after a version upgrade which broke the way I used audio for the Chinese text, I tried the flashcard add-on in for Pleco. I am really pleased with that, too, and feel I should give it a plug here. 1. Builtin natural (not synthesised) audio. 2. Builtin stroke order animations. 3. Builtin dictionary to look up related words or subphrases. 4. Integrated with Pleco reader — as you read text, it is easy to add unknown words to the flashcards. Much of the above functionality could be obtained in Anki by links to external web sites, but with Pleco it is builtin, out of the box. And with relevance to flachcard overflow, Pleco does not really have the concepts of flashcards and flashcard decks. There are just wordlists, test types and score files that can be arbitrarily mixed and matched. I actually found that easier to understand and easier to tweak to my needs. However, I realise that for casual learners, Anki might be too hard to use and the advantages you bring up with Pleco are all valid. In your opinion, when/where does basic end and intermediate begin? It helps, but as you noted these things are hard to judge! I used different decks for special events or topics until just now. Decks were names like “China 2013”, “China 2014” but also “Time related vocabulary”, “Rosetta Stone” and so on. I had nine decks. Some had only some words but decks like “China 2013” had quite a lot of cards in them. I wrote “until now” because I just merged of of the nine decks into one called “mandarin”. This is due to some problems I ran into and I want to document them here just to save others time. Of course, other can as well don’t see my problems as their own, but still it’s good to know. So basically it was just one bigger problem. 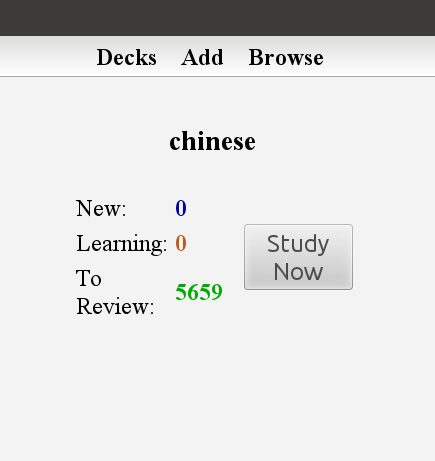 When you set Anki to review like 50 cards a day and 20 new cards a day with 9 decks this will be 450 review cards and 180 new words… per day. That’s not always manageable. Of course you can set the values lower which I did, but it’s still exploding or isn’t that productive. Of course it feels good to have 9 decks with “0 0 0” on some days, but it happend quite often that I managed to review only 3 or 4 decks and to see the rest is still to be reviewed can be frustrating. Another problem was a rather psychological one. I didn’t like 2 or 3 decks, because I knew that there are some phrases or words I always forget (I think because I lack motivation to learn them, which is another issue) and hence I didn’t reviewed the hole deck as often as the others (which of course doesn’t help in remembering the trouble ones). So now everything is in one deck. I intend to experiment with temporary decks which are filtered by tags. I tagged the cards with their old deck name in addition to (just a few) other tags. BTW: What kind of tags are you guys using? Any advice? I have a tag like “phrase” so that I can learn them separately if I want to (I had a deck called like that). But I also have tags like “taijiquan” (I’m practicing this martial art intensively and related vocabulary is tagged, but I just started using this technique). 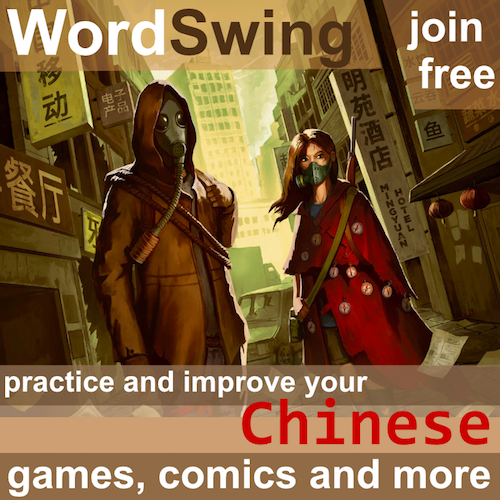 I thought about using tags like “noun” or “verb”, but then in Chinese verbs can be used nominal and nouns can be verbs. I use three fields called “zhongwen”, “pinyin” and “german”. I show the first two together as right now I’m concentrating only on speaking not on reading or writing. I want to get accustomed to the characters as well of course, that’s why I also show them (and with a much bigger font size). It helps as often I recognize some characters. This is especially helpful when you have related words like “主意” and “意见”. Then I realize that they share one character and can remember it better. But as stated earlier, I don’t actively learn the characters right now. I thought about adding a note or another field which gives me some context information. With that I mainly mean where I learned the word (I don’t use textbooks, only try to talk to people) and who taught me the word. I can remember situations very, very well and with that kind of context I think I could learn easier (I had that idea just two days ago). I’m documenting this, just to give others a hint, that you can use any information that helps you to remember. My brain remembers situations and places very well. You might have other preferences. Use them. Ok, bevor this will become a complete post of it own, I’ll stop here. I tend to use only one deck per subject (Mandarin, IPA, French, etc. ), there is no reason (I think) to split Mandarin into several decks. I think you can tag as much as you like, the more the better, although it obviously stops being meaningful at some point. I usually tag at least for the source (textbooks when I used them), but nowadays I don’t care that much and seldom tag at all. Since I create different types of cards (cloze, recognition and so on), that works as an additional filter. This is enough for me, at least. Hmm… I never thought about the cloze cards until I read your article. That might be a good idea for a later stage I think. Great article. But I am still intrigued as to how exactly you would go about carrying out your method. For example, as an intermediate learner, let’s say you ran into the word “熟悉“, and you have never seen either character before, nor the word. How would you proceed? How would your ANKI flashcard(s) look for this character? I currently am fed up with my current method. 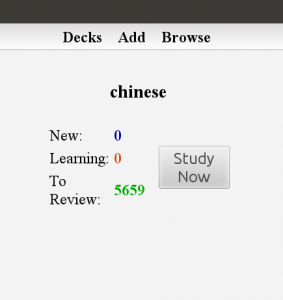 I use ANKI for recall: I add an example sentence using the word in which I put the English on the front and the Chinese on the back. I use skritter for character recognition (and practice writing only the top 1000 characters). However, I feel that I should not be using skritter for recognition. Any tips? It depends on how patient you are, I guess. If very patient, then just add recall, trust that you will read/listen enough to learn how it’s used, then start using it weeks or months from now when you feel comfortable with it. If you’re in a hurry, add a very short phrase, either with a cloze test or translation from Chinese (or a picture or whatever you prefer).